Hair Loss is the main problem that Mommy Jane face daily. Looking for the solutions to reduce the hair thinning is the best way to maintain a healthy hair. Mommy Jane recently came across HairMax+ Malaysia and had tried it out for 3 weeks. HairMax+ Malaysia was founded by Dato' Foo Mei Yen and Sean Phan in December 2016. They were inspired to start a Company that would provide its customers a simple-to-use and effective hair care solution at an affordable price. HairMaz+ Malaysia has grown leaps and bounds ever since. Their extraordinary result achieved by their customers is setting a new industry standard for others to follow. Losing a lot of hair (more than 100 hairs a day) can be caused by inherited factors, disease, stress, medicines, injury, aging or haircare. Therefore choosing the right haircare is very important to reduce its impact. Every morning, after I wash my hair, I will spray HairMax+ Hair Growth Tonic on my scalp and do a scalp massage for 10 to 15 minutes to stimulate blood circulation to the hair follicles, while the tonic itself moisturise and conditions the hair and scalp. Tonic is recommended to keep in fridge to keep it freshness as no preservatives were added in it. HairMax+ Hair Growth Tonic (Strong Formula) will helps in hair regrowth for thinning and baldness hair. Just spray on scalp 1 to 2 times daily and you can see the results within 2 to 3 weeks. The content per bottle at 150ml and price at RM115. Since the hair serum a bit oily, I prefer to use it at night before I went to bed. Just apply once a day in a small amount i.e. 1 or 2 drops. 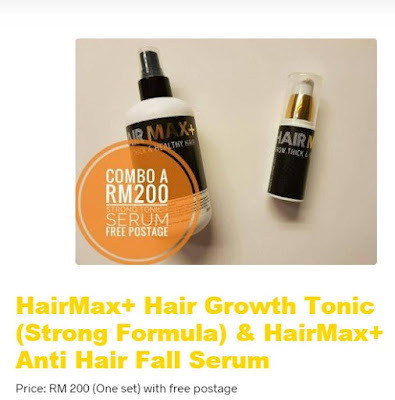 HairMax+ Anti Hair Fall Serum will reduce our hair fall by 90%. Block DHT hormone at scalp area, reactivate inactive hair follicles, accelerate hair growth, soften hair follicles, strengthen hair roots and used for thinning and baldness hair. The results can be seen in 1 to 2 weeks times. The bottle content at 30ml and price at RM85. HairMax+ is having a promotion now. For a combo of HairMax+ Hair Growth Tonic and HairMax+ Anti Hair Fall Serum, the price will be at RM200 with free postage. Another good news are, HairMax+ is giving 10% off with any purchase of their products for my readers here. Just mentioned "MommyJane10" and make your purchase by pm them at their facebook page at www.facebook.com/HairMaxPlusSeremban or whatsapp them at 012-3649931. For more information, do check out their website at www.hairmaxplus.com. After using HairMax+ Hair Growth Tonic and HairMax+ Anti Hair Fall Serum for 3 weeks now, my hair loss had reduce. Can see small amount of baby hair had grow at my scalp to cover some of my baldness. The results were proven and hope more hair will be growing up soon for Mommy Jane to looks pretty especially Chinese New Year is approaching soon. wahhhh nice! must try for my hair jugak.. sbb rasa tak sihat jugak rambut ada gugur. Dboy, you should for a healthier hair. Seri, just the serum and tonic to make our hair grow more especially at the balding area. a.. lately rambut pun banyak gugur mungkin lifestyle yang tak terurus kot.. nanti boleh la cari produk ni..
Atie, do try it out. Tonik memang wajib dah ada untuk ibu ibu. Rambut gugur kerap sekarang. Shampoo pun jenis hair fall control je sekarang. Tahniah mommy dah jumpa solusi! Ruby, thank you. If not, really sad when hair keeps on dropping. Hair loss seems to be so common now especially after delivery, I'm using this too and it works for me. Jia Shin, glad to hear that. sangat cocok untuk yang punya masalah dengan rambut, berapa harga? Danan, tonic and serum at RM200. Iffah, then we have to take good care of our hair already before it is too late. Thanks for sharing this info. I will share the goodness with my parents as they need it too. All the best ok.
Rawlins, thanks for your support. 100 hair loss a day could be normal but still scary for me. That's why I take care of my hair a lot. That includes no haircoloring and minimizing tieing my hair to ponytail. Blair, me too especially my hair is so soft. 1. Spray HairMax+ tonic on your scalp before sleep. 3. Spray more on your hair loss area. 4. For fast results, its recommended that you apply the tonic once every night before sleep without miss. 5. Please take photo before you start applying the tonic and on a weekly basis to monitor your progress. 1. Apply serum after applying HairMax+ hair tonic. 2. One to two pumps of serum onto scalp. 3. Massage scalp for 30 seconds to ensure serum covers balding areas. 5. Wash the next morning with shampoo. 6. You are advised to apply serum 3 to 4 times a week and only during night time. Hi Sean, thanks for sharing the instructions here. Robert, thanks for your compliments. Hi Jane, can i know how is your progress so far? One can suffer hair loss at any age and the condition generally results in receding hairline. Ayurvedic Hair Fall treatment includes many natural ingredients that nourish the scalp and helps in Hair fall treatment. Ayurvedic treatment is effective and does not have any side effects. They are natural and help in faster hair growth.